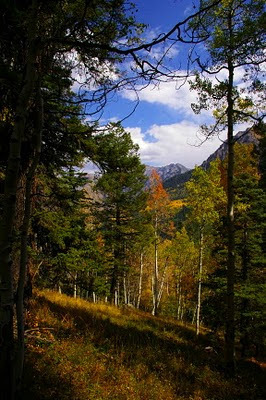 Fall colors near Ouray, Colorado. This photo of fall aspen colors is posted pursuant to the Colorado Photography Act of 1964 (familiarly called the "Ektachrome Act"), which requires that all professional and semi-professional photographers in the state—essentially anyone who has ever sold a photo—shoot at least one full roll of slide film on scenic shots featuring golden aspen groves. That most photography is now digital appears to have escaped the legislature, which has not updated the statute's language. Well done. Glad to know you're a law abiding citizen. I cannot get my students to follow that law, even though our campus is covered with fantastic fall-color trees. I'll send them here. What happens if you shoot Fujichrome instead? Do they deport you to Japan? Mslcolm, As much as I personally preferred Fujichrome, I never heard anyone say "It's a perfect Fujichrome day." What is That Little Girl Doing to the Weather? When You Own a Dog Like Fisher . . .